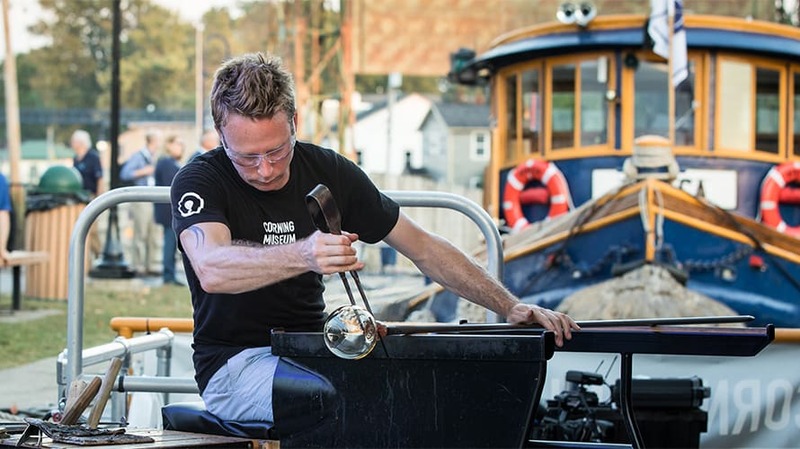 The Corning Museum of Glass’ GlassBarge is a 4-month traveling exhibit. You’re on a barge, languidly motoring up the Hudson River in bucolic New York on a crystal-clear early summer afternoon. You pass tree-lined shores on both sides of the river, as a glass blower takes an amorphous blob of glass and slowly shapes it into a colorful fish. You look over the side of the boat, thinking about the history of both the waterway you’re on and the reason you’re there: to experience a museum exhibit on water. The Corning Museum of Glass’ GlassBarge is a four-month traveling exhibit, celebrating the glass manufacturer’s journey from Brooklyn to Corning, N.Y. in 1868. It moves north up the Hudson and then banks west, concluding in the Finger Lakes (there is a land-lubber finish with a celebratory hoedown in Corning) in late September. In a world constantly bombarding us with push notifications and utterly forgettable online ads, live events such as a riverboat museum exhibit cuts through the noise, creating a memorable experience. Marketers, recognizing the power of experiential advertising to connect with their audience, often tie events with other channels for sustained relationship building. For example, at a recent Adweek event, Robert Spratlen, svp digital media and audience science at Viacom, recommended marketers should “go beyond the screen” to connect face-to-face in live events. By linking that in-person interaction with the digital connection, on-screen communication, he argued, can be that much more effective. According to a recent Event Marketer study, 84 percent of brands said that event marketing is an integral aspect of their marketing campaigns. Sticking with what works, 86 percent said they would keep at least the same number of live events from 2017 or even increase them in 2018. A new tool in the experiential tool kit, branded hospitality tours, offers customers engaging live experiences. These are beyond pop-up stores, giving the brand something around which to center its communication with its target audience. For example, at this year’s South by Southwest interactive festival, HBO and Giant Spoon created a Westworld experience for attendees. It was the talk of the event, as the show’s creators, HBO’s marketing team and Giant Spoon wrote 444 pages of scripts for the 60 actors who brought Westworld to Austin. And while not every advertiser can do something at the scale of a big budget television show, brands are finding their own niches. Rob Cassetti, The Corning Museum of Glass’ senior director of creative strategy and audience engagement, offers a case in point. He knows that live glass blowing is a major draw for the museum and has taken it on the road or, in this case, the water, for years. But this year the museum resolved “to show some love closer to home” while marking the 150th anniversary of glassblowing arriving in Corning via boats, as well as the Erie Canal Bicentennial. He said that “early indicators are extremely positive.” For one thing, “every show sold out,” including the weekday morning ones– and while there isn’t a charge to attend, entry still depends on having a ticket from Eventbrite. For marketers, being able to capture data from tickets can be as important as capturing data from sales. The advantage of using a platform like Eventbrite is not just to keep the number of visitors in order but also to gain a contact list with relevant contextual information like location and household size. This is an essential part of integrating the live event into the larger marketing strategy, establishing a digital trail from order through attendance to follow up to purchase.